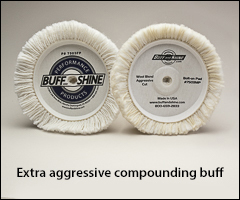 Compounding buffs, polishing buffs, finishing buffs, compounding pads, polishing pads, buffing pads, wool buffs, foam pads. For smaller wool buffs, see the Buffs for 3" and 5" pads page. 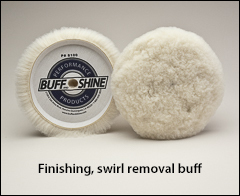 Backing pads are shown on our Backing pads for wool buffs page. SAFETY WARNING: Make sure the maximum RPM of the item you choose, is equal to or more than the RPM of the backing pad and power tool you are using. WARNING: Proposition 65 Label for all buffs shown below. Most popular buff. 9 1/2" outside diameter, 7 1/2" backing pad surface, 100% 4 ply twisted wool. 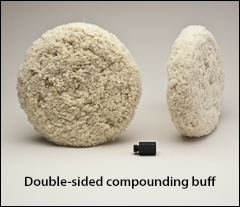 Used for compounding and cutting. Made more aggressive to run hotter for use with cutting compounds. J1406 is made with extra reinforcement for use with 5,000 RPM grinders; not like lighter duty paint shop buffers. Strong washable backing. Bolt-on buffs heavily reinforced hub and extra thick wool pile. high quality material and plush durable fibers. Maximum RPM: is 3,000. 9 1/2" outside diameter, 7 1/2" diameter backing pad surface, 1 1/2" pile. Coarse wool/poly blend for quick aggressive cutting. 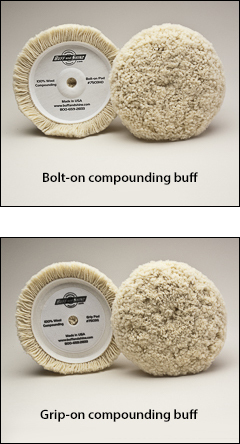 Heavy-duty industrial bolt-on buffs with reinforced center hubs are excellent for cultured marble and fiberglass buffing. Heavy duty backing allows you to run at high RPM applications. Not for automotive use. Maximum RPM: is 5,000. 8" diameter buffs. 100% 4 ply twisted wool in two different pile heights. 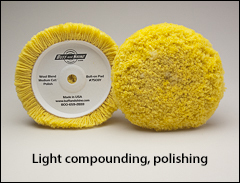 Also available in some different wool blend formulas for lighter compounding and polishing. J1441 adapter threads into the buff and then onto a 5/8"-11 spindle. Maximum RPM: is 3,000. 9 1/2" outside diameter, 7 1/2" diameter backing pad surface. Wool blend 4 ply twist, 50% wool 50% acrylic, 1 1/2" pile height. Extra thick wool pile, reinforced center hub, and a strong washable backing. Maximum RPM: is 5,000. 9 1/2" outside diameter, 7 1/2" diameter backing pad surface. 100% wool with a 1 1/2" pile height. Grip-on, hook and loop backing. But can also be used as a bolt-on pad. Works well on dark tops. Just a couple of passes get the job done. Plush durable fibers, and a strong washable backing structure. Recommended finishing speed: approximately 1,750 RPM. Maximum RPM: is 3,000. 9" outside diameter, 7 1/2" diameter backing pad surface. 100% reticulated polyester foam pad is 1 1/2" thick with hook and loop backing. 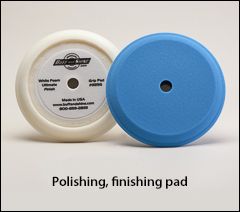 Contour edge conveniently fits automotive style lines for easy buffing. Recommended finishing speed: 1,200-1,750 RPM.